Back in November, Merchoid revealed new t-shirts for the highly-anticipated Batman v Superman: Dawn of Justice featuring horrific promo art depicting Batman (Ben Affleck) as the "Gotham Demon" and Superman (Henry Cavill) as a "False God." 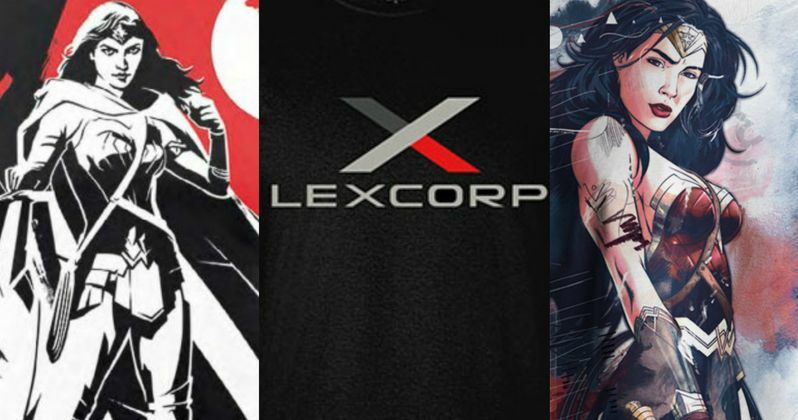 Today, the company has unveiled even more merchandise, including artistic t-shirts featuring Batman, Superman, Wonder Woman, and even the LexCorp logo. These items will be available for purchase at the end of January, and you can visit the Merchoid website to pre-order these items today. Batman v Superman: Dawn of Justice will launch Warner Bros.' DC Comics movie slate, which includes Suicide Squad, Justice League Part 1, Justice League Part 2 and stand alone movies featuring the Justice League members. Fearing the actions of a god-like superhero left unchecked, Gotham City's own formidable, forceful vigilante takes on Metropolis's most revered, modern-day savior, while the world wrestles with what sort of hero it really needs. And with Batman vs Superman at war with one another, a new threat quickly arises, putting mankind in greater danger than it's ever known before. Batman v Superman: Dawn of Justice brings both Batman and Superman to the big screen for the first time, while featuring other iconic DC Comics characters such as Wonder Woman (Gal Gadot), Lex Luthor (Jesse Eisenberg), and Alfred Pennyworth (Jeremy Irons). The supporting cast includes Man of Steel stars Amy Adams (Lois Lane), Diane Lane (Martha Kent) and Laurence Fishburne (Perry White), along with Holly Hunter in a role created specifically for this movie. Other supporting cast members include Jena Malone, Callan Mulvey, Jeffrey Dean Morgan, Tao Okamoto and Scoot McNairy. Jena Malone has been rumored to play Barbara Gordon, while Callan Mulvey is rumored to portray Anatoli Knyazev, also known as KGBeast. Zack Snyder directs Batman v Superman: Dawn of Justice from a script by Chris Terrio. Both the writer and director will return for Justice League Part 1 and Justice League Part 2, which starts production this coming spring in London. Before that two-part adventure arrives, though, the villains will take over the big screen in Suicide Squad, arriving August 5, 2016. Warner Bros. released the third trailer for Batman v Superman: Dawn of Justice, but with just under three months left until this highly-anticipated superhero movie hits theaters, it isn't known if another trailer will debut between now and then. But while we wait for any new tidbits of footage to arrive, you can feast your eyes on these new merchandise photos from Batman v Superman: Dawn of Justice, arriving in theaters March 25, 2016. Will you be picking up any of these t-shirts or hats for yourself, or the superhero fan in your life?